Indulge in your own paradise with the smooth, tropical flavor of coconut ice cream that will make your mind travel to the most exotic places in the world. 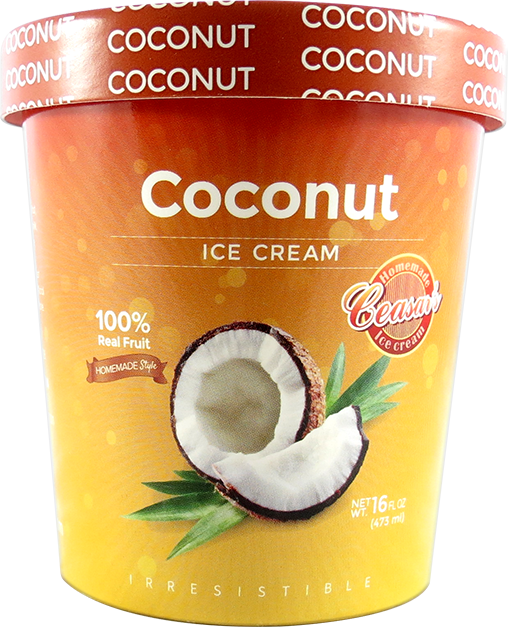 Coconut Flakes, Coconut Cream, milkfat, nonfat milk,sugar, corn syrup,buttermilk, whey, mono & diglycerides, guar gum, cellulose gum, disodium phosphate, calcium sulfate, polysorbate 80, locust bean gum, carrageenan, gelatin, artificial flavor, natural color, vitamin A, palmitate. It is almost impossible to enjoy the taste of coconut without envisioning sunshine and sandy beaches, lying under tropical palm trees and the sea becoming the only path that your eyes follow. The feeling is incomparable. The delightful flavor and revitalizing aroma make even the hottest days feel refreshing. From the moment our coconut ice cream touches your palate, the rich, creamy flavor transports you back into the vacation of your dreams. The memories of hearing the laughter of children playing with friends on a hot summer day slip back into your mind with every scoop.